Light Duty roller shutters is a layer of shutter curtain made by light weight material serve as a security barrier. Material Range: Aluminium & zincalume steel; with the option of powder coated finishing, color coated, or natural finishing. Slat thickness is between 0.5 to 0.6mm. 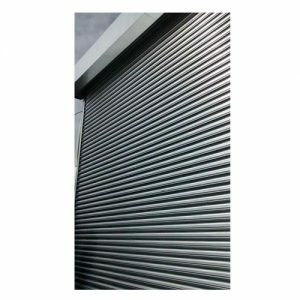 Light Duty roller shutters with the functionality of reversible motion, combine with the light weight advantage allowing the user to manually operating it. Application: Office shop lot, serve as the most basic form of security barrier. Maximum single panel coverage clear opening is W 4000mm x H 2400mm. Type Operation: Spring Type / Motorized.